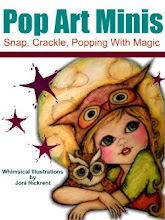 Pop Art Minis: Holiday Cards & Gifts Galore In The Pop Art Minis Zazzle Store! Holiday Cards & Gifts Galore In The Pop Art Minis Zazzle Store! 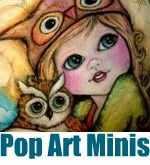 Tis the season for giving and the Pop Art Minis Zazzle Store is full of goodies and gifts galore! Pop by and take a look around...you never know what holiday fun there is to be found! Here's a peek at just a few of my holiday designs! Big Eyes and Bright Smiles! Greeting Cards for sending to friends across the miles. Stickers for adding a perfect touch to a package. Tote Bags for carrying gifts to and fro! Your characters seem to get cuter and cuter. I really admire the eyes. The little, beautiful ladies make me smile. They look so charming and vivid!